Dealing with unsightly spider veins or varicose veins? No worries! Dr. Glenn DeBias and his highly trained staff at The Institute have successfully performed thousands of spider vein laser treatments/varicose veins treatments. Further, Dr. DeBias is an expert in the knowledge, training, and application of laser technology. The Institute offers a wide array of state-of-the-art energy-based and skin laser treatments to help refresh your look and improve your skin health. Unsightly spider veins on the face, nose, chest, and legs affect millions of people around the country. 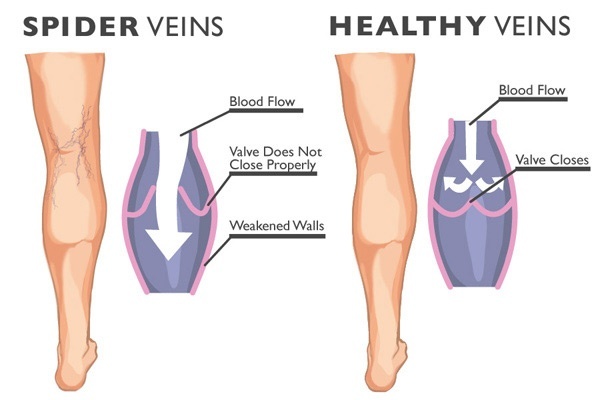 Spider veins are red or purplish in color and may result from sun exposure, hormone therapy, the aging process or heredity. Fortunately, advanced laser technology now offers a safe and effective treatment for the removal of spider veins (telangiectasias). Small, superficial red veins can be successfully treated with the Nd: areYAG laser. Several treatments are required over monthly intervals. With a beam of light, the laser can deliver a prescribed dose of energy to the spider veins. The laser “selectively” coagulates the problem veins while sparing surrounding areas. After treatment, the vessel slowly and naturally disappears. Dr. DeBias will work with you to determine a treatment plan that will yield the best results and outcomes for your needs and expectations. This is something that must be determined with each patient individually, but the majority of patients will benefit from this treatment. This non-invasive laser spider vein removal treatment process takes about 10-20 minutes, depending on your situation. After treatment, there is no downtime – which means you can resume all of your normal activities immediately afterward.